Are you looking for a Katy TX AC repair company? There are numerous companies in the area. Finding the right one can take sometimes feel overwhelming. It is important to take your time as you search. Hiring a disreputable company could result in poor work and the need for repeated repairs. The right company can finish your repairs quickly, with accuracy, and with a lasting guarantee. Be picky when looking for a Katy air conditioning repair service. It is important to find one that can complete work safely, on time, and with the assurance that it lasts. There are a few things you can keep in mind to help you find the best service. Ideally, you can find a company that meets the requirements discussed below. Never settle for a company that can only meet a few of these factors. The most trustworthy companies in the area can always meet those requirements. If you are searching for Katy-based air conditioning services, contact Houston Admiral today. You can reach office staff by calling 281-706-8691 to learn more. Houston Admiral is able to offer a variety of services to new and returning customers across the Katy area. Learn more about the services they offer by visiting them at https://goadmiral.com. 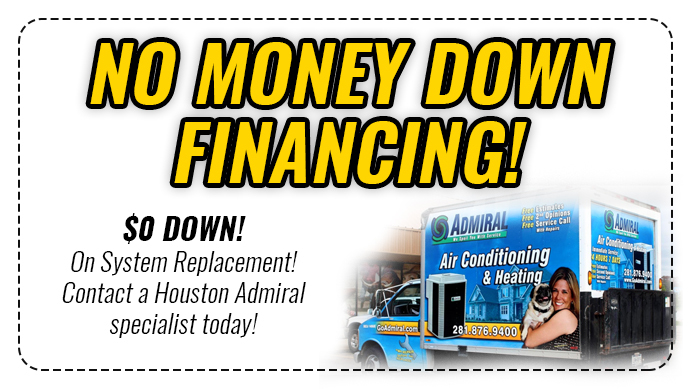 If you are searching for an HVAC company that can repair, replace, and service AC units, call Houston Admiral today. Houston Admiral can meet all of the requirements set out below while exceeding your expectations. When looking for an AC repair specialist in Katy, make sure you find one with experience. Makes and models of AC units vary dramatically across the area. Some are aged, while others are brand new models. When repairs are required, it’s important to find a company that is familiar with numerous units. This familiarity means the technician can quickly and accurately identify errors in your unit. As a result, they can complete repairs, order parts, and ensure your unit works perfectly faster. Houston Admiral has many years of experience operating in the Katy area. Technicians employed by Houston Admiral are familiar with AC units of all types. They can repair, replace, and service just about any make or model. Hiring Houston Admiral means having qualified technicians attend at your home. They can work with you to repair your unit in a timely way, minimizing the impact a broken one has on your family. You can reach Houston Admiral by calling 281-706-8691. Visit them online at https://goadmiral.com to learn more about their wide range of services. It is also important to find a Katy-based air conditioning repair service that guarantees its work. Hiring a company that does not offer warranties or guarantees often means you waste your money. When a company offers a guarantee or warranty, it means it stands behind the work of its technicians. This can give you peace of mind and help justify the expense of repairing your unit. No one wants to think they are throwing money away or have repeated issues with the same unit. A company that provides a warranty is one that is confident in its work. As a result, you can trust these companies to keep you and your family cool. Houston Admiral is proud to offer the area’s only lifetime warranty. You can trust Houston Admiral to stand behind the work of its technicians. If you are nervous about having your unit repaired, serviced, or replaced, contact Houston Admiral today. You can reach friendly office staff by calling 281-706-8691. You can also learn more about the services provided by visiting https://goadmiral.com today. Try to find an air conditioning service in Katy with positive reviews. Look for reviews that speak to the professionalism of the technicians sent to your home. Make sure that the people sent over can repair your unit quickly and with accuracy. You do not want to have to contact the same repair company repeatedly to ensure your AC unit works. You can find out the reputation the company has by asking friends and family. Looking online and reading reviews is also a great way to determine if the AC service is reputable. Finally, take the time to ask around. Online reviews cannot tell you everything you need to know about a company. Asking friends, family, and colleagues can give you personalized information about the service. If you are looking for positively reviewed company, contact Houston Admiral today. It has many years of experience in the Katy and Houston area. Houston Admiral can assist businesses and residents alike, providing top notch service. You can contact office staff to arrange a free service visit today by calling 281-706-8691. Homeowners interested in learning more can visit https://goadmiral.com. Hiring the best repair company in Katy, TX takes time. You need to research each company in your area. Make sure you are not blinded by low prices. Cheap labor typically translates to poor work. It is important to rely on the work performed to last. No one wants to have the same issue with their AC unit multiple times. Take the time to read reviews, speak to your friends, and interview the company. Representatives should be happy to answer your questions. If you find a repair company that is uncomfortable providing responses to your questions, look for another one. 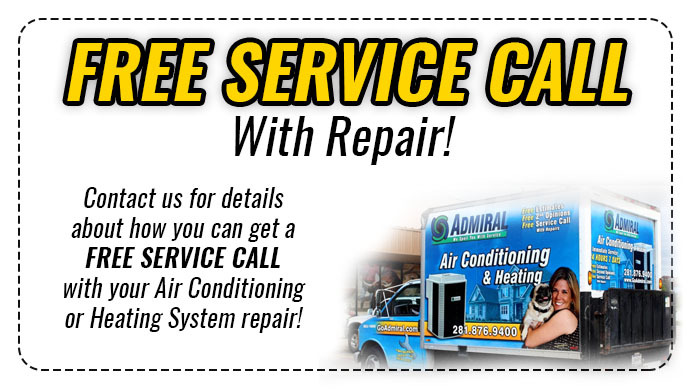 Residents of Katy, Texas can contact Houston Admiral for their air conditioning needs. Houston Admiral has a team of motivated and knowledgeable technicians on staff ready to help you with your issues. New and returning customers can contact the office staff at 281-706-8691. You can also visit Houston Admiral online at https://goadmiral.com. If you are looking for the best Katy TX AC repair company, contact Houston Admiral today.